Cleavers (Galium aparine) medicinal herb is a traditional plant that is native to Asia, Europe as well as North Africa. The entire plant may be used as herbal medicine. It is a herbaceous annual herb from the Rubiaceae family. I must say that it has a very unique name and it does behave as the name suggests due to its cleaving or clinging nature. 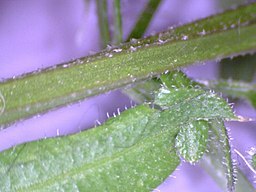 This is a result of the many tiny hooks that cover the plant. It is now one of the naturalized species in countries such as Mexico, United States, South America, Central America, Australia, Canada and also various oceanic islands. It is also considered an injurious weed or noxious weed. The common names are Cheese rent herb, Catchweed, Cleaverwort, Bedstraw, Scratchweed, Clivers, Stickweed, Galium aparine, Goosegrass, Coachweed, Savoyan, Goose's hair, Poor robin, Grip grass, Milk sweet, Velcro weed, Gravel grass, Clabber grass, Sticky willy, Goslin weed, Robin-run-the-hedge, sticky willow as well as Hedge burrs. The medicinal properties are diuretic, refrigerant, tonic, aperient and alterative. One of its main constituent is tannin. Other constituents include a red die, iridoid glycosides, phenolic acids, flavonoids, citric acid, coumarins, monotropein, and aucubin. This herb is an excellent remedy for bladder and kidney ailments. It is most effective for suppression of urine making it a diuretic plant. It is also good to promote excellent and bright complexion by making it into a wash for the face and other parts of the skin. A poultice made from this medicinal herb can be placed on burns as well as wounds, cuts and bruises to bring about natural healing. It can treat ailments such as catarrh of the intestines, malaria, measles, scurvy, fever, scarlet fevers, dropsy and cancer. The uses of this plant are extended to eczema, scrofula as well as other skin diseases. It can also be used to treat gonorrhea diseases. In case you do not want to make it into a tea, then you have the choice of using the leaves and stems just like spinach or callaloo. In this way, it is most useful to purify the blood and strengthen the liver. The edible plant should be used before it bears fruits. Use one ounce of the herb to one pint of hot water and allow to simmer for approximately twenty minutes. Then consume one teaspoonful of cleavers three times per day.